As a local business it is a common knowledge now that the internet is the new horizon to reach your target market. In this article we’ll talk about your the important local SEO priorities for your local business to consider and perform inorder to gain an upper hand in your industry. But before anything else, do you know what the Yellow Pages are? Not many people do. While there might be a few floating around as vestiges in old-style bars or your local DMV, the vast majority of Yellow Books get used as a doorstop, thrown into the fire kindle pile, or even thrown directly into the recycle bin. Nowadays, anyone who has access to the internet does a simple google search on their computer, tablet or smart device to find what they’re looking for. Everything from gardening services to local restaurants to nearby hospitals is found online with a simple, “Ok Google”. While other search engines are managing to hold on—Bing stands out as an example worth mentioning— it is clear that Google has a vice grip on the search engine world. Even if a customer is looking for something local, they will still type their search into the famous white search bar to find the best option for their needs. This means that as a local business owner, it is IMPERATIVE that you not only show up on a Google Search Results Page but as close to the top as possible (because let’s face it: who goes to the third or even second page of a Google Search?). 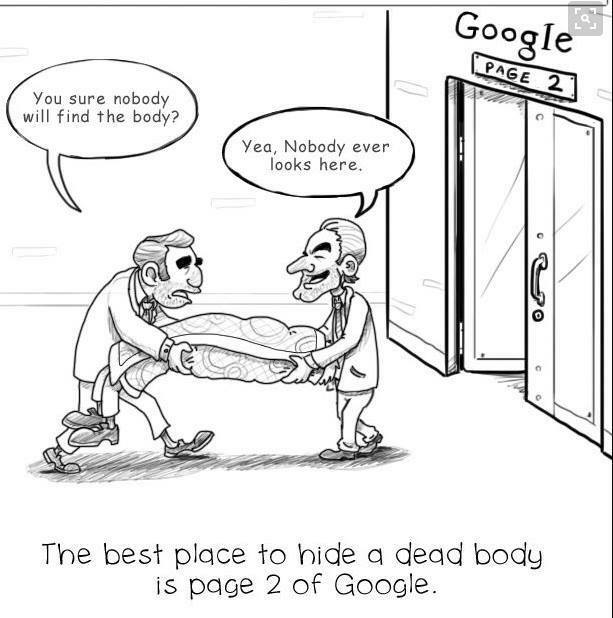 As the famous joke goes, “The best place to hide a dead body is page 2 of Google search Result”. Here are the top 4 Local SEO Priorities for Local Businesses to consider to boost SEO! The words customers use to search for a local business are critical in analyzing how to increase a page’s Google presence. When selecting keyword for a local website, consider not only the relevance of the keyword to the target audience or industry but also include the city or state. For example, a search for “Chinese Food” will most likely bring up the general Wikipedia page, but “Libertyville Chinese Food” has a much better chance of bringing up a local restaurant in Libertyville. Even particular neighborhood terms can be useful when crafting the proper keywords to put in title tags, meta descriptions, and page content. Make sure a full address and phone number are visible on every page of the website in question. It’s an absolute necessity to make sure all of the relevant information on Google My Business is current and updates. When a customer searches Google maps, the “pack” of businesses listed first have not reached that coveted spot by mere coincidence; they have optimized their SEO profile to be listed at the top. Even on Google Maps, searchers rarely move past the few options unless they are somehow unsatisfied with what they’ve seen, and these optimized profiles have the best chance of making it to the top listing. And yet it is continually surprised how many businesses haven’t even verified their Google listing. An owner simply confirming that their business exists and has legitimate contact information can result in a significant increment in-store traffic, website traffic, and sales. Adding photos, descriptions, a menu (if applicable) and updating hours is a simple yet effective way for a local business to make their Google listing relevant, therefore boosting its local SEO rating. A good business owner also has verified listings on other large, yet less popular, websites such as Yelp, Bing Local, Yahoo!, and Mapquest. Many business owners upkeep their websites in a minimal capacity, especially if their main services are offered offline; some local businesses even have a single landing page containing a small about section and contact information. However, adding content to a business website not only makes it feel more appealing and professional to potential customers but also improves your SEO rating and Google listing. Blogging, for example, is a strong way to share community-relevant content; writing about local community members who frequent the business or highlighting local events is a great way to begin to create a sense of community for clients. Anything “link-worthy” that can be shared between clients or on social media is a tremendous boost for a budding company website’s search rating. Partnering with local agencies to create inbound links helps to demonstrate a business’s relevance in a particular community to various search engines Activities such as participating in local events, sponsoring local charities, and joining the local chamber of commerce build a business’s presence both off and online. In the end, both parties benefit by linking each other in their various online content. Inbound links develop a local business’s reputation while simultaneously boosting their search engine optimization. One of the fundamental mistakes many local businesses make is having poor website construction; their most important pages are only reachable through links from the main navigation bar or the page footer. Add internal links were relevant from within your pages’ content, including blog posts, informational pages and key service pages. We consistently see lifts in rankings (maps and organic) after improving websites’ internal linking structure. Getting a publication or shout out in a local newspaper is one of the best ways a local business can improve their search engine optimization, as well-established media sites naturally have high indexed on Google. Local businesses owners can work to build lasting relationships with outlets such as the local news channel or daily press to be featured repeatedly on and offline.Not only does this overall increase exposure, but will tremendously increase local SEO ratings. Many local business owners underestimate the potency of online ratings, feeling that their offline reputation is the only true measure of how they are viewed in the community. While word of mouth is most certainly important, the modern world’s worth of mouth is, in fact, online reviews such as Yelp or Google. To stay on top of their online reputation, local business owners must be proactive in tracking, managing and amassing online reviews. There are a few key websites which focus on business review depending on the sector—Yelp is particularly relevant in the United States for food, and sites such as Angie’s List focus on home services. These are certainly important to consider, but local businesses should focus on their Google My Business page as their key review website; high-quality reviews on Google not only improve a business’s online reputation but also improve their overall visibility on the search engine. Most of these suggestions feel fairly straightforward— in fact, the concepts in themselves are relatively easy to accomplish. Once one starts to truly delve themselves into the work that is Search Engine Optimization, however, it quickly becomes apparent that not only is it difficult to optimize in the right way, but it is also quite time-consuming. In 2018, it is necessary for any business to have a strong online presence and reputation; if a business owner is unable to manage consistently their online profile, they might want to consider hiring a service to monitor this service for them. By adding a professional to the team, local owners can be confident to have regularly optimized search engine ratings, a higher online profile, and ultimately more business. For your Business’ Local SEO services contact us, we offer competitive pricing on our SEO services that will surely address your Local SEO Priorities!